The root of the perennial herbaceous plants Dipsacus asperoides C. Y. Cheng et T. M. Ai of family Teasel. Mainly produced in Hubei, Sichuan and Yunnan provinces in China. Slightly fragrant, bitter, slightly sweet and slightly astringent. Coarse, soft and with green-black cross section. Sliced, unprocessed or stir-baked with salt solution or liquor. Tonify liver and kidney, strengthen tendons and bones, promote blood circulation, continue the physique, and prevent abortion. It is a common herb for soreness and pain in lumbar and knees, atrophy-flaccidity and limpness of lower limes caused by deficiency of liver and kidney, because it can tonify liver and kidney, strengthen tendons and bones, furthermore, it is tonifying but not greasy. For soreness and pain in lumbar and knees, atrophy-flaccidity and limpness of lower limbs, it can be used with other herbs to tonify liver and kidney, strengthen tendons and bones, for instance, it is used with Du Zhong, Niu Xi and Bu Gu Zhi in the formula Xu Duan Wan from Fu Shou Jing Fang (Essential Prescriptions of Longevitive Life Preservation). For it can tonify liver and kidney, strengthen tendons and bones, and promote blood circulation to alleviate pain, strengthen atrophy-flaccidity to relieve arthratgia. It is indicated for lumbar pain, feet flaccidity, spasm and pain due to liver and kidney deficiency, stagnation of cold and blood, or chronic arthralgia of wind-damp type with liver and kidney deficiency. In addition, it can be used for impotence, seminal emission, spermatorrhea, enuresis and frequent urination due to kidney yang deficiency, but these symptoms are not its first indications, therefore, it is an auxiliary herb for these symptoms. It is a common herb in traumatology because it can activate blood to remove stasis and alleviate pain, tonify deficiency and promote the flow of qi to continue the physique. For falling, hitting and other injuries, hematoma, swelling and pain, it could be combined with blood-activating and pain-relieving herbs, for instance, it is used with Ru Xiang, Mo Yao, Tao Ren and Hong Hua. For tendons injuries and fracture, it could be combined with blood-activating and physique-continuing herbs, for instance, it is used with Tu Bie Chong, Zi Ran Tong, Gu Sui Bu. It is a common herb used for threatened abortion, vaginal bleeding during pregnancy, habitual abortion due to liver and kidney deficiency, insecurity of thoroughfare and conception vessels, because it can tonify liver and kidney, regulate and strengthen thoroughfare and conception vessels to prevent abortion. It should be combined with kidney and liver-tonifying, and abortion-preventing herbs, for instance, it is used with Sang Ji Sheng, Tu Si Zi in the formula Shou Tai Wan from Yi Xue Zhong Zhong Can Xi Lu. 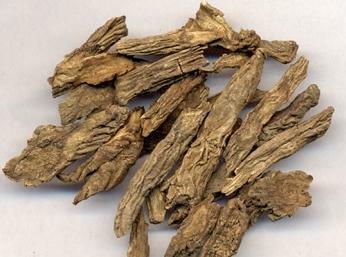 For threatened abortion, vaginal bleeding during pregnancy due to external injury, it is combined with herbs to activate blood and move qi, prevent abortion, for instance, it is used with Dang Gui, Chuan Xiong, Sha Ren. Decoct 10~15 g. Stir-baked with salty water for tonifying liver and kidney, strengthening tendons and bones, stir-baked with alcoholic for activating blood and unblocking collaterals.